Not all AMD PCIe motherboards are inevitably equipped with a nForce4 chipset. 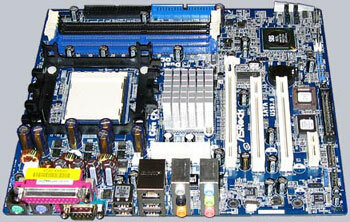 ASRock shows us, what’s possible with a SiS 756 chipset in combination with a SiS 965L South Bridge. The inexpensive ASRock 939S56-M Socket 939 PCIe motherboard offers the most important features, which are necessary for the entrance into the fast 16x PCI express technology. Further details regarding the equipment, performance and overclocking of the approx. 54 Euro PCIe motherboard are tested in the latest ocinside.de motherboard Review and is also compared in the overview with the 12 so far tested S939 boards.